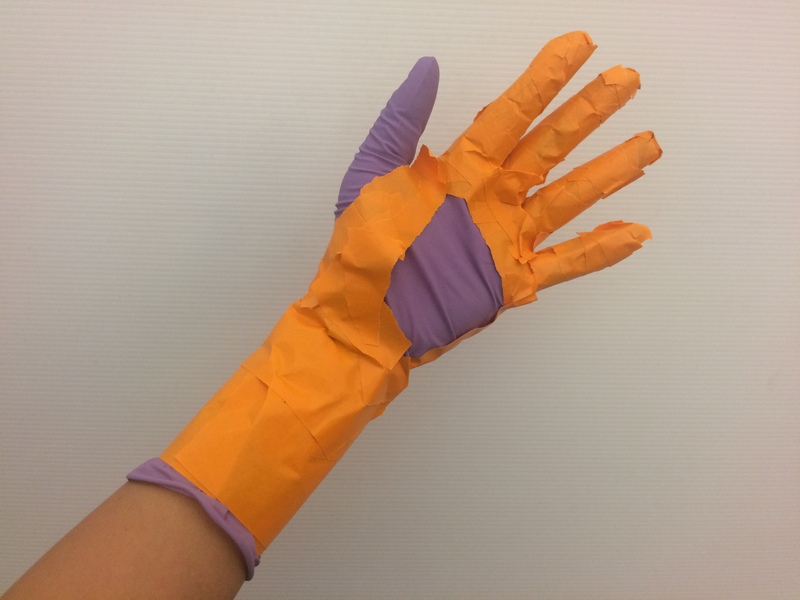 While working on the conductive temporary tattoos, a wearable glove prototype is being concurrently developed. 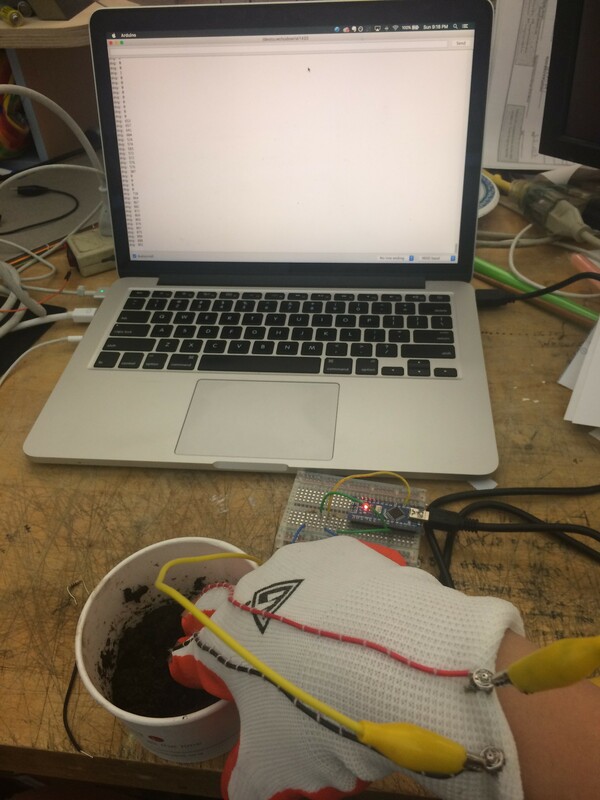 While wearing a glove creates a barrier for the hand to be immersed in the environment (ie: fully touching the soil), building the sensors onto the glove also allows for a device that can be used repeatedly. 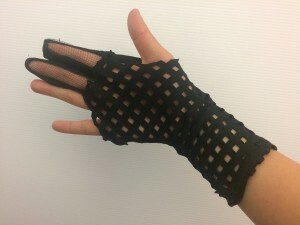 Flexible materials along with techniques for e-textiles can also be utilized to create traces that can sit on the fingers comfortably and that are robust enough to withstand the movement of the fingers from bending. Other glove projects, such as the mi.mu project and the Flora MIDI drum glove, feature built in components into a glove. They offer interesting insights on how materials and components can be situated in the structure of the glove. For example, the mi.mu uses channels on top of each finger to house the bend sensors so that they are held close to each finger but held securely in place. The microcontroller, components and battery are held in a separate wrist band which can be connected to the rest of the glove, allowing for easy removal and attachment from the bend sensor elements. The Flora MIDI drum is a project that uses the drumming of the fingers against the surface to play synths. In this project, with accompanying tutorial, piezos are attached to the fingertips of a preexisting glove. These pieces are then attached and soldered to a wearable microcontroller attached to the the back of the glove. 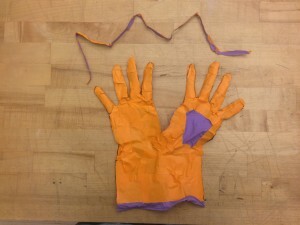 Although this piece needs to be plugged into a computer to generate the tones, it provides insight in how the surface of the glove can be embedded with electronics. However, unlike my glove project, neither of these deal with working directly in a natural environment. In both instances, these gloves are used for musical performance in which the musician or performer wears the glove and uses the gestures of their hand and fingers to compose and form the music. In the case of the Hand-Substrate Interface needs to be able to interact with the substrate, mostly earth in this case to get a reading. As a result this glove needs to be produced with that interaction in mind in regards to sensor placement and material choices. In the first image of this post, the initial glove prototype can be used fairly effectively in order to sense soil moisture. Using a gardening glove, two exposed traces made out of conductive fabric are fused to the tips of the index and middle finger using heat-fusible webbing. 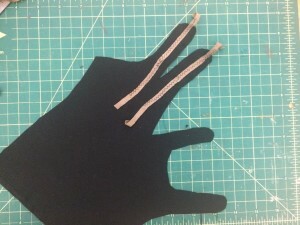 These trace are then connected to wires which are connected to the surface of the glove using couching, an embroidery technique. With couching, a piece of thread is used to sew around a thicker piece of thread, wire in this case, by stitching around it in equal intervals. This allows for the wire to become attached to the surface while retaining the flexibility. As an initial proof of concept, this glove is effective in obtaining soil moisture readouts. However, the thickness of the glove can create discrepancies in the soil reading and the heavy rubber coating at along the fingertips also can mask the user’s interaction with the soil. This prototype also relies on a separate breadboard and a laptop in order to see the output of the sensor. In these series of prototypes, a custom glove is patterned and designed in order to make a glove that can sit closer to the hand, along with using materials that can allow for environmental interactions. Designs are also considered in how the hardware and output can be housed directly on the hand. A custom pattern was created for the glove by utilizing a low-fi patterning technique. A latex glove was worn as a base, while painters tape was applied in strips to cover the exterior. 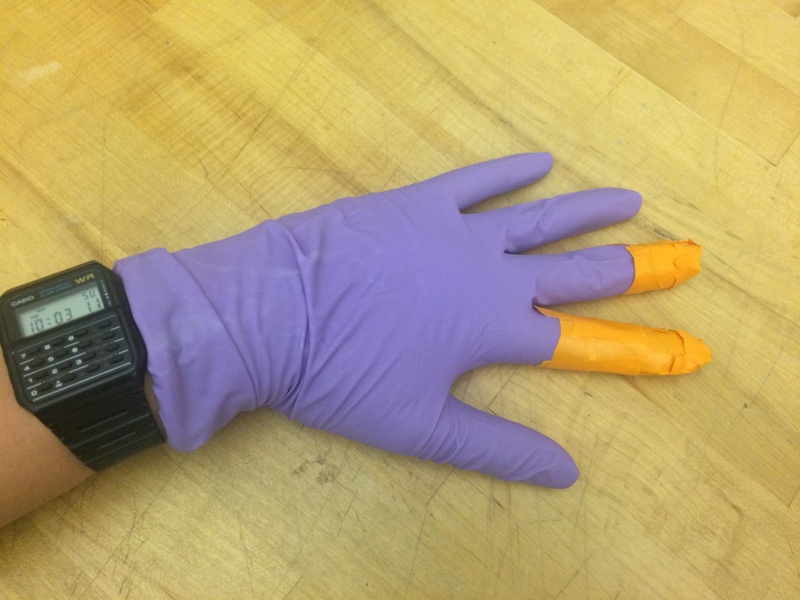 Since the thumb is currently not being used in the final glove, it was omitted from taping, though the other fingers besides the index and middle were covered in case the pattern needed to be modified to account for those fingers. Essentially by covering the latex glove with tape, a casted model of the hand is produced. After covering the glove, a seam was cut off the side in order to free the glove and tape from the hand. Tracing from the fingertip to finger, the fourchette, the part of the glove that gives depth to the each of the fingers is cut out. The taped glove can then be splayed and traced to provide a custom master pattern for producing the prototype. Once the master pattern is traced, modifications can then made by using tracing paper to change features of how the glove is constructed. For example, traces can be drawn in, along with determining which regions of the glove can be sewn out of different materials. 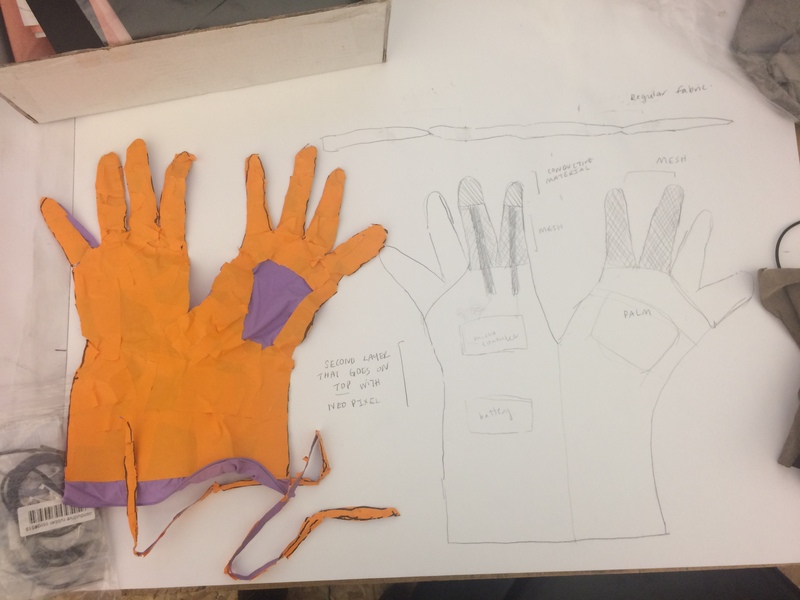 The first prototype using the glove pattern was to test out the pattern, along with integrate some different materials into the piece. The “fingernail” area was constructed out of copper taffeta fabric to provide conductive traces, while a mesh netting was used in the bottom and top of the fingers. The fourchette was cut out of a black knit jersey material in a polyester blend, while the palm area was made out of a jersey polyester blend that had cut out details. An 1/8″ seam allowance was added to all the pattern pieces in order to make sure that the glove would still be true to the pattern with all the additional piecing happening at the finger areas. In constructing the glove, the copper material was first sewn to the mesh netting to complete the top of the finger. The fourchette was then sewn to connect the top of the fingers to the back. In later iterations, it would be advised to sew the fingers to the rest of the glove before sewing them to the fourchette. 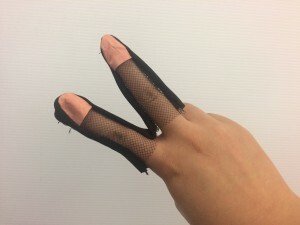 This would allow for better shaping to occur at the base of the fingers, rather than the puckering that happened when sewn after connecting it to the fourchette. Once the top and bottom hand panels were sewn onto the finger pieces, they were seamed at both sides to create the tubular form for the hand. After sewing all the pieces together, extra material was trimmed off that was covering parts of the ring and pinky finger to allow for less constricted movement. Any fabric that was not sewn into a seam was then finished using a rolled hem to prevent fraying. This prototype proved to be a fairly successful attempt in satisfying the original goals. 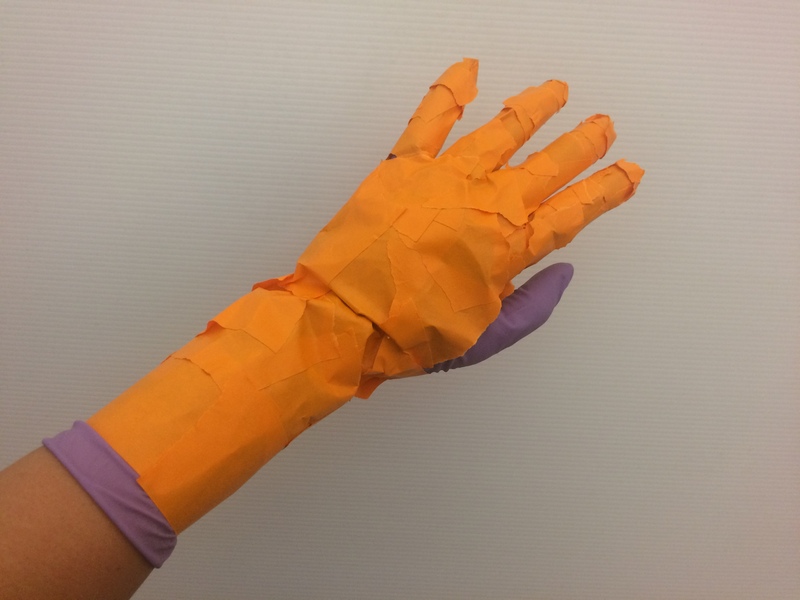 This first prototype created a glove that fit well on the hand even when constructed out of different materials. Although there were some fit issue along the middle finger, this may be due to the difficulty of sewing the fourchette onto the fingers given that there are a lot of tight curves that need to be made in order to fit the finger pieces. 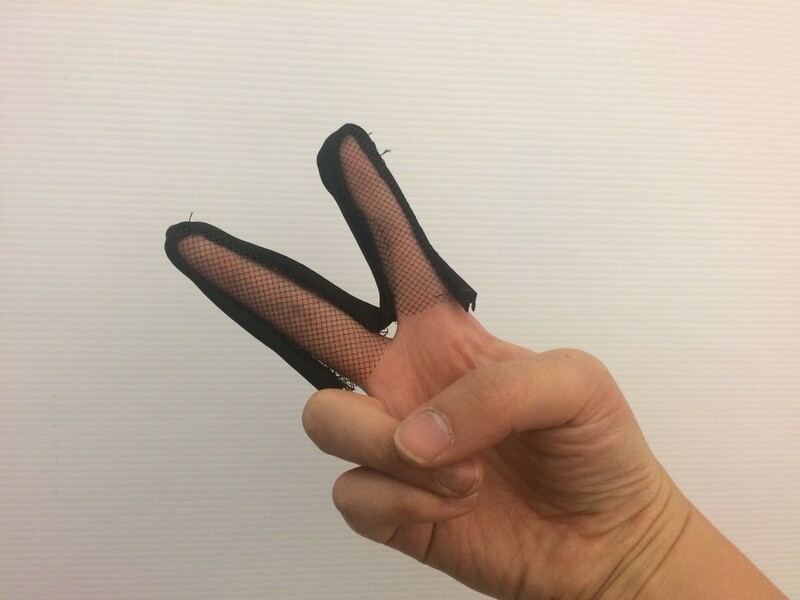 One other issue with the prototype was the use of the conductive fabric in the “fingernail” region. While this design fits with the anatomy of the hand, the proximity of the two conductive areas do touch when the fingers are placed close together and may compromise the reading of the sensor. Going forward with a second prototype, this issue was taken into consideration when constructing the traces. 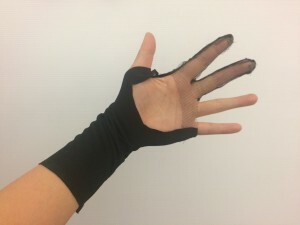 The second prototype for the glove addresses some of the issues in the first glove, including the fit around the finger and how to embed the traces into the glove. This version also used a modification of the pattern to create an open palm area. To create the traces for this prototype, two strips of conductive spandex were first sewn onto the top of each of the finger pieces using a zig zag stitch. By using a zig zag stitch, this ensured that both of the pieces would be adhered together but retain the stretchiness of both fabrics. One of the main challenges of this prototype is placing these traces on the finger, as seen in other iterations of the Hand-Substrate Interface using the conductive temporary tattoos. The movement created by the fingers makes it challenging to rigid materials while allowing the hand to also not be completely shrouded by the material of the glove. 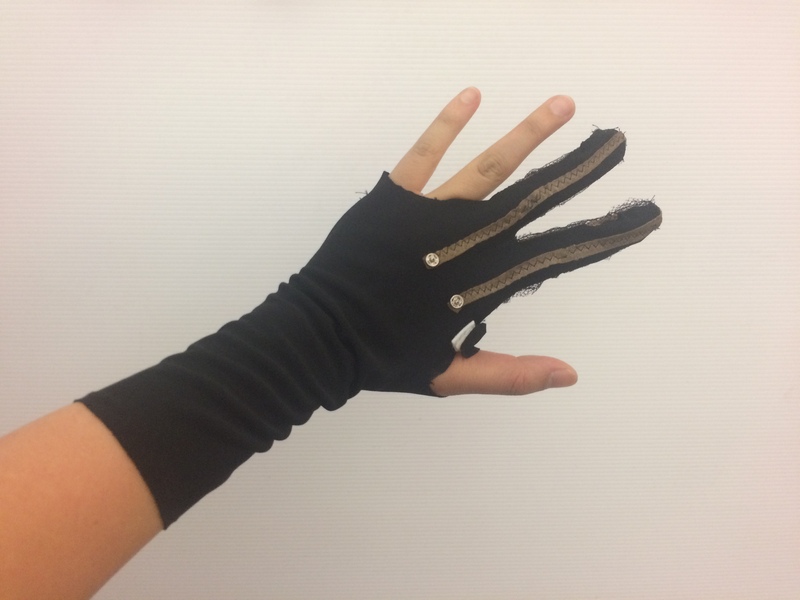 An extra 1/2″ segment of the conductive spandex was left at the end of the fingers so that it could be sewn around the tip of the fingers after the glove has been assembled. The mesh netting is now used for the bottom of the fingers so that when making contact with the earth, the traces will produce a readout of the ground while the bottom of the hand will be more exposed to the soil based on material choices. 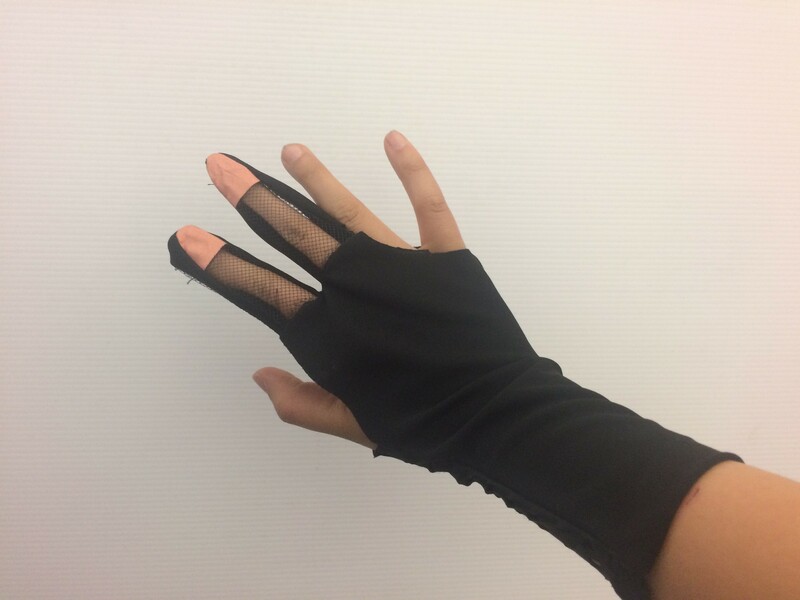 In this prototype, a velcro closure is attached to for the panel around the thumb so that it can be more easily worn with the potential for adjustment. In contrast to the temporary tattoo piece which is a one time use, the glove version will be able to be used multiple times and thus considerations are being made on the overall wearability of the piece. Previous Previous post: Hand Substrate Interface Continued..
Next Next post: Hand Substrate Interface Prototyping Continued!